The Members Section contains 101 videos and is updated weekly. "2010 has been such an awesome road for me", Amer Abdulbaki says and beams with joy. The fitness model was chosen as Personal Trainer of the Year 2010 in World Physique Magazine. "He had impressed us with his ability to teach and inspire", the magazine constitutes its decision. What made you decide to get into the fitness industry? I always enjoyed being active, healthy, and looking and feeling my best. I was always athletic and played at an elite level in many sports. I wanted to take the knowledge and work ethic and apply it to help others achieve their goals, whilst doing what I love. What do you feel sets you apart from all other personal trainers out there? I am hard working, dedicated to helping people, and most of all, I’m honest and realistic with my clients. You've probably seen it yourself, the personal trainer at the gym text messaging or on a phone call while training somebody? When I’m training somebody, I treat it like anything else I do, I give them 100%. Being realistic I think is the key. If you give people false hopes, or lead them to believing they can lose 30 lbs. in 2 weeks, you are setting your client of for failure and disappointment. I love to encourage, at times I feel as though I’m not only a trainer but somewhat of a coach, in that I push people to their limits and encourage in a positive way. Another thing that really sets me apart from most trainers is that I live the lifestyle and practice what I preach. I really believe in the advice and knowledge I give to others, because I am proof that it works! You always have to keep your clients motivated. What motivates you? My family motivates me to be the best I can be, as well as, setting personal and career goals. Without goals I’d be on a path to nowhere. You would never hop in your car for the sake of driving with no destination in mind, right? So, why would you do that in life? When I help somebody get in better shape, mentally and physically, that motivates me. Also, writing articles and receiving emails from people letting me know that I have educated them motivates me. When I get images published, that motivates me. I look at my life and career as a snowball effect; the more goals I achieve, the more "good" and more opportunities come my way. What forms of exercise do you find to be the most effective to gain mass? 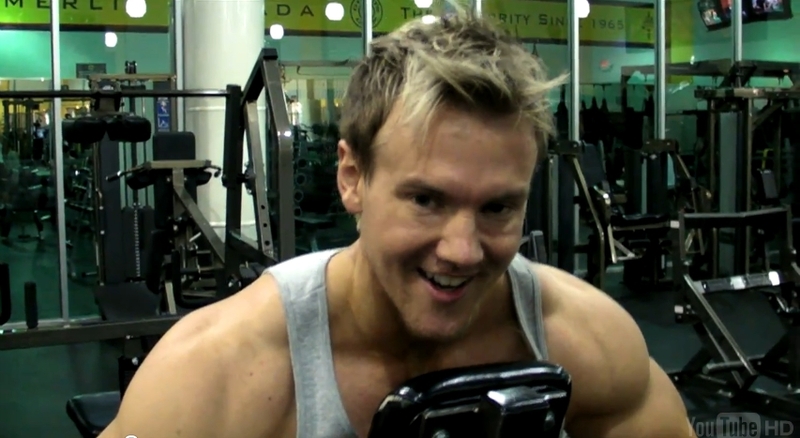 Basic exercises such as bench press, squats, dead-lifts, and rows will help to gain mass. 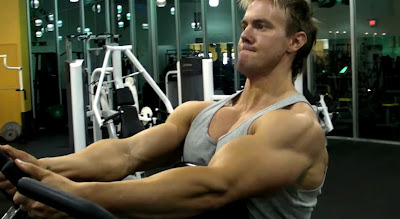 You don't need to lift heavy to grow, but you do need to feel the workout and the muscle contractions to grow. What are your strengths and weaknesses as a fitness model? My weakness is that I love food. It's not too much the crap food that gets to me, it’s just being able to sit down sometimes with the family and enjoy a home cooked meal. Sometimes as a fitness athlete we can't do that due to diet restrictions. My strength is that I never give up! I am fortunate enough to have learned early in life to never give up and keep chasing your dream. Nobody will ever hand you anything, so you have to get out there, put in the work, and educate yourself as much as possible. I would rather spend my life chasing my dream in hopes of capturing it and never actually getting it, rather than not chasing it and wondering if I could have captured it! The reason for Amer's success may be expressed in one of his statements: "Without goals, I'd be on a path to nowhere. You would never hop in your car for the sake of driving with no destination in mind, right? So, why would you do that in life?" He is born for bodybuilding, his many fans say. This is true obviously. Mahmoud Al Durrah, 24 year old, from Cairo, Egypt, has built a highly impressive physique. 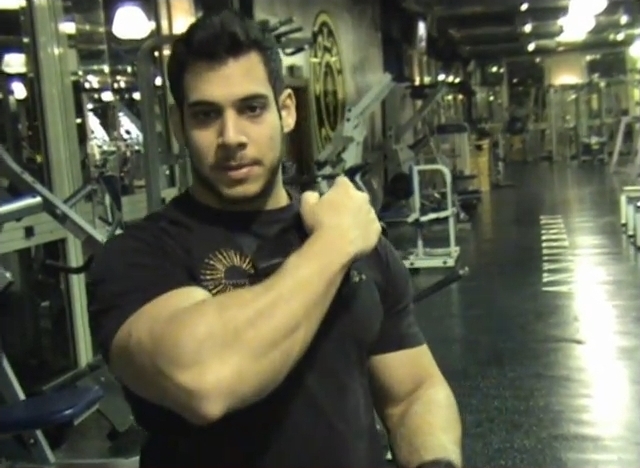 In this instructional music video Durrah and his friend, Hadary, train back and biceps. 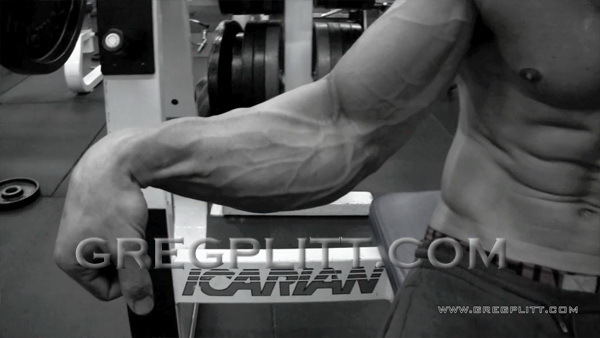 Be prepared: When Durrah trains biceps, his arms and t-shirt seem to explode. His hard training has been very effective. 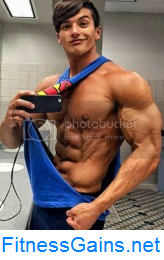 Fitness model and bodybuilder Ronald has enormously bulked up. AllAmericanGuys have published a set of new photos which show him much more massive and ripped, and several new videos which document his workout. You find a big number of high quality photos and videos with Ronald here on AllAmericanGuys. What workout enthusiast wouldn't love to have an upper body like his? Now Anthony G.'s many fans will be delighted. On AllAmericanGuys not only new stunning photos have been published, but also a long best-of-video showing the young muscle man working out, posing and flexing in top shape. You find all of Anthony G.'s high quality photos and videos here on AllAmericanGuys. 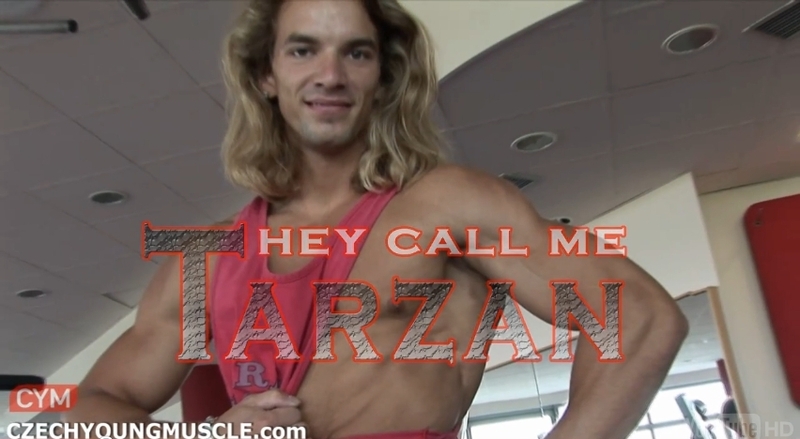 You can order the DVD here on CzechYoungMuscle. Gain muscle, lose fat, get ripped: David Rich's Fitness E-Book teaches you how to reach your fitness goals efficiently and professionally. The book is comprehensive and detailed, and covers nutrition, cardio, and workout systems. 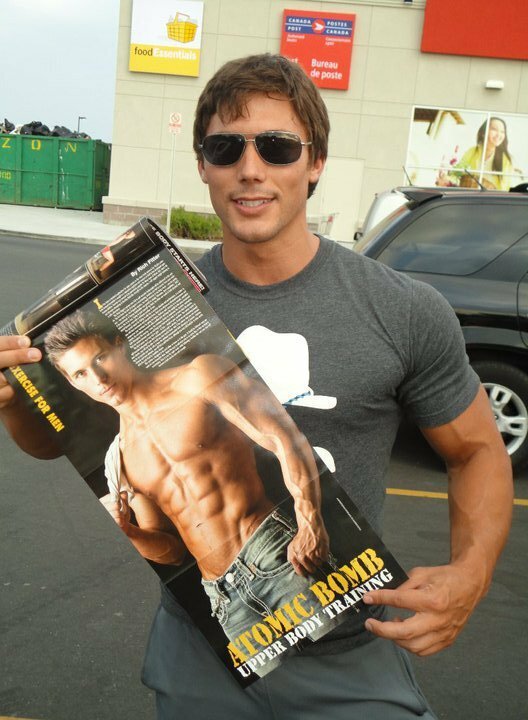 Now the fitness expert and model shares it for free. Go to DavidRichFitness.com, enter your name and email, and get your free copy of David Rich's Fitness Secrets E-book ($49 value). 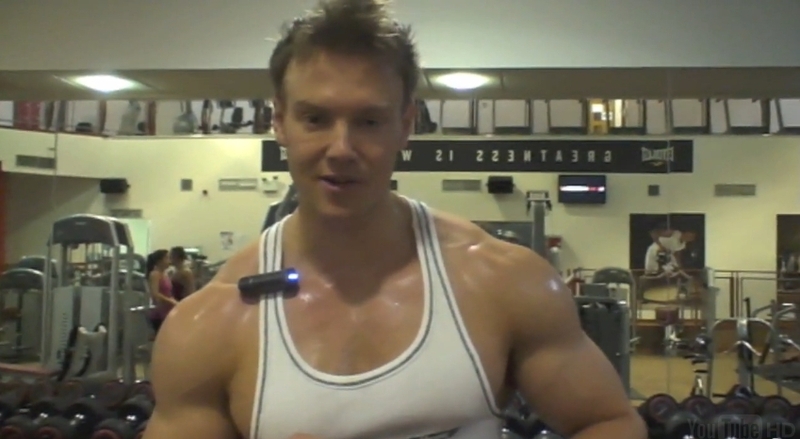 "Make every rep count", Rob Riches advises. "It's not about the numbers. The muscles work on an actual feeling: stimuli and stress." In this video the bodybuilder and top fitness model explains how muscles grow, and gives many tips. During a workout in Las Vegas at Jay Cutler's Gold's gym, Rob was questioned by Andre Davids also about nutrition, especially cheat meals - and alcohol! There is at least one reason why this man is special. Beside his brilliant look, his impressive physique, his profound fitness knowledge, Tyler Sarry has one more essential quality: The man is fun. A showman. He is humorous, ironic, smart, and expresses it in his workout videos, many of them posted here on WorkoutInspiration.net. This is how he distinguishes himself: His fresh, outgoing personality is highly motivating. Good to see that his future place may not be only the gym but also a film studio: Tyler is taking acting courses and workshops in Los Angeles and Toronto to improve his on-camera skills. "As a child, I was always very active and played almost every sport imaginable, through various leagues and school sports teams. Upon entering highschool, I decided to explore my passion for skateboarding and other extreme sports which were more independent, but sometimes criticized for not being “real” sports. One day, when I was still in highschool, I was messing around at the local YMCA with a few friends in the gym area, and demonstrating the improper form of how exercises could be done. A fairly large man named Fred approached my friends and myself, and asked us if we would like to set up an appointment to learn how to lift weights the proper way. We agreed, and the next week myself and one of my friends showed up for what would be the start of my fitness obsession. From that point on, I became fixated on fitness and the notion of turning my body into one of the images on the many posters of sculpted physiques that were plastered all over my wall. While most students played highschool football or college basketball, I idolized men with chiseled pecs and abs of steel, hoping one day to possess that picture perfect physique. I was literally in the gym every day trying to work my way toward that ideal body type that I admired so greatly. My dedication to weight lifting was so extreme that, between the ages of sixteen and seventeen, I converted my bedroom into a weight room, and I slept on the balcony each night, dreaming of my aspirations and goals for the future. All throughout college, you could either find me in the gym, outside for a run, or of course, in class, working hard at my studies. I originally wanted to get into bodybuilding, but after realizing the downfalls, not to mention the “ups” and “downs” (and I am not only referring to weight!) of the sport, I decided to stick with what I love doing! Staying in “photo-shape” year round, competing, networking, traveling, and knowing that there is nothing else that I would rather be doing, are all that I need in order to be happy. When I am not traveling, pursuing acting, or in the gym myself, you can usually catch me training one of my clients and doing my best to spark the interest in someone else that Fred sparked in me so many years ago!" "Get a rip and get ripped" is the motivating line on his website Tyler-Sarry.com where he offers galleries, videos, a shop, and a contact page for personal training and nutrition plans. So train with Tyler! Double benefit: You'll get ripped, and you'll surely have fun.